Counterfeit Cat premieres on Disney XD on 12th May 2016 at 4.30pm. Disney XD is launching its brand new animated comedy series Counterfeit Cat, which follows the adventures of Max and Gark. 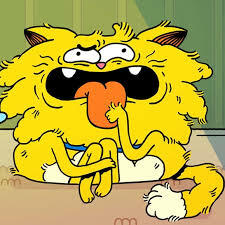 Gark is not a real cat, he’s a Counterfeit Cat. He’s a small blue alien in a purple cat costume. Max is a real cat: fat, fluffy, yellow and constantly pampered by his elderly rap-battling, kung-fu fighting, cat loving owner Betty. Armed with an array of super-cool powers, a handful of weird and whacky ideas and Gark’s delusional spaceship called Throckmorton, who crash landed into Betty’s laundry room, the intergalactic possibilities are endless for our over-excited alien and reluctant house cat duo. The voice cast includes Marc Wootton (“Nativity”) as Max, Alex Kelly (“Frankenstein’s Cat”) as Gark and Kayvan Novak (“Fonejacker”) as Betty and Throckmorton. Plus a whole host of other voices including comedian Katherine Ryan as pedigree cat, Ranceford and sweet but not very smart pigeon, Nelson, and Poldark’s Kyle Soller as wisecracking squirrel, The Kid. Tagged 2d Animation, 2D Animator, Animation, Animation Director, Animator, Disney, Wildseed.